High quality, lightweight Fresnel Widescreen Monitor LCD Magnifier Lens provides a sharp, crisp image that more than doubles character size. Adjustability feature lets you select magnification level. Nonglare surface for comfortable viewing. Patented metal bracket design installs magnifier lens quickly and easily onto your flat panel LCD monitor. 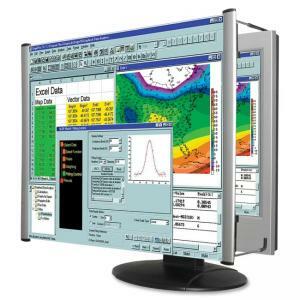 Fits 21-1/2" and 22" widescreen monitors.